I had the pleasure yesterday in attending a lecture being held by the Friends of African and African American Art at the Detroit Institute of Arts. The person of high esteem that graced us with his presence and presented us with his wisdom and life in the arts was Wadsworth Jarrell. 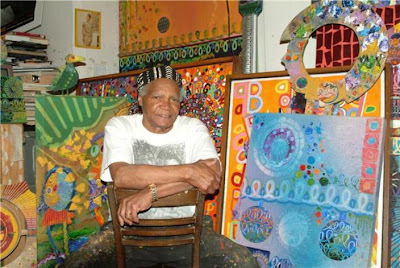 His work spoke volumes in the 60's, 70's and 80's when he formed as a co-founder the Afro Cobra movement. A revolutionary African American art group that wanted to bring to the art world a presence and representation of an African American context and aesthetic. The bright colors and interwoven compositions are brilliant in his work. He spoke on his travels, his life and his amazing career. Once the lecture was finished I had the great opportunity of meeting with the man and talked to him about art, his life and his ideas. Within that hour or more of conversation he provided me with valuable information that will last a lifetime. Unknowingly, I found that he was also signing copies of a new published book which I purchased of course and got a personalized signed copy. Throughout the evening I was able to sit next to the man and have great conversation with him and his brother in law, who is also an artist. Mr. Jarrell is a very down to earth man and is cool as hell. I have found a new friend and a better mentor. Thank you for the opportunity Mr. Jarrell. SO who invited you to this event Mr. Moore? How did you get to sit next to him?